Rose-colored glasses or not, The Legend of Zelda: Majora's Mask remains an interesting entry to the series that's as weird, terrifying, heart-breaking, and brilliant as ever. In 2000, Nintendo created a game that stitched a strange experiment into its being, leading it to become more than just an add on to its successful predecessor, The Legend of Zelda: Ocarina of Time. The release of Majora's Mask 3D does more than enhance its graphics. It brings with it that reminder of just how different and creative a game it dared to be. And what a creative experiment. The series itself is known for its inventive new mechanics, adding a little flavor to its core with every new iteration, but ultimately staying true to a Zelda formula that makes the series great. Majora's Mask still follows this sequence of dungeon exploration and unlocking new items to complete each. However, it's the one mechanic that Link has in his arsenal that not only aids his dungeon crawling, but is tied to the very fabric of what makes this game so unique: time travel. With his ability to manipulate time, Link is forced to place Termina in a precarious three day Groundhog Day Doomsday scenario. In doing so, this leads him to not just save the day, but become closely invested in the lives of those he has to save. This makes Majora's Mask a lot more fleshed out through its character studies — peeking into the daily routines and problems of the townsfolk, then watching them as they struggle with or come to terms with their mortality. These smaller interactions create a feeling of a heavier, personal burden for Link and give him a more grounded presence in Termina's world. It's one in which he's more a friend and 'Hero to the People' than just the Hero of Time. Perhaps most tragic is that until Link completely breaks the cycle, each of his victories are fragmented, temporary wins. There are some who will be saved one cycle, and committed to failure and suffering in the next. Everyone in Termina gets to relive their joys and fears multiple times with Link privy to them all. It contributes to an overall feeling of hopelessness, and loneliness — a major theme underlying Majora's Mask narrative — but also a fierce determination to save Termina once and for all. Majora's Mask was given a one-year development cycle, which is crazy short, especially when creating a new flagship Zelda title. This was a motivating factor behind the game's 72-hour day-night cycle. Inside of those three short days, there's so much to do. Termina is bursting with life, and each character has a unique and intriguing story to tell. So many of the quests are delightfully non-Zelda in the best possible way. In Zelda titles, most sidequests serve as little more than a means to an end, but Majora's Mask's work double-time, fleshing out the narrative while also doling out rewards. So many of them are time-specific too. In fact, the way Majora's Mask handles time travel is absolutely masterful. The level of refinement shown in Eiji Aonuma's directorial debut to the series is proof enough why he's still in charge of it to this day. Collecting all of the game's masks requires a level of familiarity with characters' schedules that could only work if you had the time travel mechanic down just right. It's this kind of stuff that keeps Nintendo fans loyal—an expert touch that few, if any developers could hope to recreate so well. Majora's Mask timed gameplay adds a layer of pressure. It makes for a challenging experience, even though there are ways to manipulate just how fast or slow time flows. With so much to do before entering a dungeon and after its completion, the game feels huge in scope, despite having one of the shortest critical paths of almost any Zelda title. Each area gets a fresh beginning after its dungeon is conquered, opening up mini-events, while closing some of those that were available before Link cleanses these infected parts of Termina. It's just one clever way in which Majora's Mask presents its complexity and it can feel overwhelming. However, careful use of the time manipulation and management forces players to think quickly, outside of the box, and keeps them on their toes. The sense of relief and excitement at finishing sequences just in the nick of time is undeniably rewarding. Just about everything in this game is tonally darker, with much of the music embodying this atmosphere too. They're not all noticeably brooding, such as the peppy Overworld Theme, that returns to Termina after Link rids each area of its curse. Some beloved pieces remain such as the Lost Woods theme from Ocarina of Time. But given the nature of the three day cycle, the pieces are poignant with the knowledge that the songs are fleeting moments of Link's triumphs as peace is temporarily restored. Each song beautifully matches the scenes they are used in, carrying with them hints of supernatural, eerie and unnerving tones. Others still are wistful, like the Astral Observatory's and Final Hours' pieces which are haunting, and magical. Then there is the expressive Clock Town tune that changes over the course of the three day cycle — at first giving an easy going impression of a love letter to life and fun of a town preparing for a Carnival; a faster tempo as panic settles in on Day 2 as the Moon approaches closer to the town and on the third day; a frenzied, emotional and warped version of the same song as doom is seemingly inevitable. Though the sounds that are perhaps the most powerful are the ones that are faint reminders in the background to exploration. 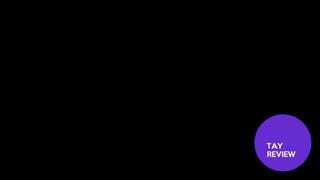 The Clock Tower bell sounding every 12 hours creates the sort of tension that Majora's Mask is known for. Majora's Mask 3D implements a few welcome changes from the original. The New Bomber's Notebook - There are little pop up notifications that occur and act as helpful reminders whenever Link makes an important character interaction. These events are recorded in The New Bomber's Notebook, along with timelines as to when you met them and useful hints about their respective quests. The Notebook itself may be a bit difficult to understand at first, but incredibly useful once you do. Along with a snazzy in-game alarm, it's a great way to keep track of all of Termina's secrets that will assist in experiencing all the weirdness this game has to offer. Making Bank - How convenient is it to have a banker right across the way from the warp point in Clock Town? Pretty convenient. It's a small, smart change that no longer has you running off from South to West Clock Town to deposit those hard earned rupees. One small step for Link, one lonely move for the Banker. ...I bet he does get awfully lonely hidden away from sight and away from his former esteemed business purveyors in West Clock Town. Poor guy. 3DS Touch & Dual Screen Magic - The touchscreen Menu interface for the 3DS makes it nice and easy to switch tabs between masks and items. Then there's the map on the top screen coupled with the menu that makes for a fluid experience. Between Ocarina of Time 3D, Wind Waker HD and Majora's Mask 3D, Nintendo has proven that inventory management is just better with a touch screen. We would have liked to have seen the option for New 3DS owners and Circle Pad Pro users to map item slots I and II to the ZL and ZR buttons, but having them accessible on the touch screen is still plenty convenient. Majora's Mask was a beautiful game on the N64, but it isn't exactly a looker by today's standards. Thankfully Grezzo gave us the same treatment they did when they ported Ocarina to the 3DS. Character models are all vastly improved, most notably in the faces, which no longer resemble blurry, painted-on caricatures. Most of the models are reused from the Ocarina of Time port, in fact, which was also true for Majora's original release. These enhancements are particularly stunning on Termina's various bosses. The moon as it looms menacingly over Clock Town, and each of the four temples' bosses were scary enough before but now, even more creepy and formidable. Textures have also (thankfully) undergone an overhaul, replacing the blurry, muddy ones of the original. From the moment you start, you'll notice the lowered fog density during the intro, the greener textures on the ground, the wood grain on Clock Town's eponymous timepiece. It's little details like this that make the 15-year-old game feel fresh and new. Majora's Mask 3D's Termina is the Termina nostalgia had falsely made us remember brought to life. To call Majora's Mask 3D a port would be an insult to the amount of care taken recreating this timeless classic. The Bombers are a helpful little group of scamps, running around town collecting gossip and information and supplying them to Link as part of their "gang". This, for me, and for many purists presents a conundrum. The information they provide is invaluable in getting masks, tracking down heart pieces and reducing some of the headaches figuring out side quests could cause. On the other hand, however, aside from having an expanded role that wasn't part of the original game, their increased capabilities just don't make sense from a narrative point of view. A huge part of what makes Majora's Mask so great is how it handles time. To figure out any character's habits and when to approach them, the player needed to observe Termina's inhabitants over the game's 72 hours to determine their movement patterns. It's perfect, and it immerses the player in the illusion of time travel. At the same time every day, NPCs do and say the same things. 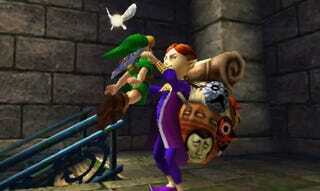 In Majora's Mask 3D, however, this rule no longer applies to The Bombers. Instead, depending on where you're at in the game, the mischief makers offer new bits of info to fill out your notebook. It's somewhat narrative-breaking; these kids somehow find time to find out what's happening all over the world to relay it to you, despite being regular citizens of Clock Town, trapped within the flow of time. That said, for new players or for those who might otherwise be intimidated by Majora's Mask's admittedly high price of entry when compared to previous Zelda titles, it's a great addition. It's just a shame that there's no way to turn this off. The new Bombers come off as exactly the kind of hand-holding that players have been begging Nintendo to avoid. We all like to think we're the best at Zelda archery, and chances are we probably can make those claims. The Gyroscope issue is a minor complaint, and won't ruin the experience for some; maybe even enhancing it for others. However, for a brief moment, there was panic when aiming at the Swamp Archery Gallery felt off. The gyroscope ability was set to default (same as it was in Ocarina of Time 3D) and hindered accuracy due to the unsteady camera movements. Whether the gyroscope is something useful to you or not —for aiming, or just looking around— this will vary as to each person's comfort level. Play around with it! Consider this a reminder that if the gyroscope does not work for you, there's the option to switch it off under the Gears menu, and this can be done at any point during the game. Zora swimming abilities have changed some. Just like the Goron roll, the Zora swim boost and the signature electrical defensive field requires use of magic. Holding down the "R" button means that Zora Link can dart through the water while being a menace. It took a little getting used to but is by no means terrible. Though it also had us involved in some momentary road underwater rage. Then there's the terror of the deep, terror no more. Majora's Mask represents a major departure from the norm for the series. It's a moodier, more emotional tale than the series has ever told. In those respects, even 15 years later, it remains unmatched. Few games are as moving and morose as Majora's Mask. Like Clock Town, this game is timeless. Majora's Mask 3D isn't just one of the greatest games on 3DS, it's one of the greatest available on any system. Still unconvinced to play Nintendo's masterpiece? Here are 12 other Reasons to consider. For a second opinion, read this review written by Keza MacDonald over on Kotaku. Thanks to the Magician @Nach212 for image and gif help. 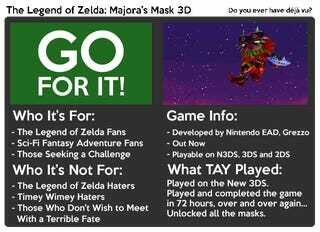 Have any Musings of your own on The Legend of Zelda: Majora's Mask 3D? Feel free to leave them in the comments below or tweet them to @koTAYku and we'll consider featuring them in a new series tentatively called "TAY Twitter Thoughts on..." . Follow N. Ho Sang here or on Twitter at @Zarnyx if you're feeling like going on a timed adventure, or you can read her articles here. Steve Bowling is an amateur game critic and aspiring freelance games journalist. In 1997, he could regularly be spotted feverishly pacing outside Software Etc. You can follow him on Twitter at @SteveBTAY, and suggest things for him to write, or you can read more of his stuff here.